It’s my habit to mark Remembrance Day by posting this fine piece of writing by my father, who at age eighteen was a soldier with the Royal Navy during World War II. A chance encounter with two small boys in the rubble in bombed-out Bristol changed his life. 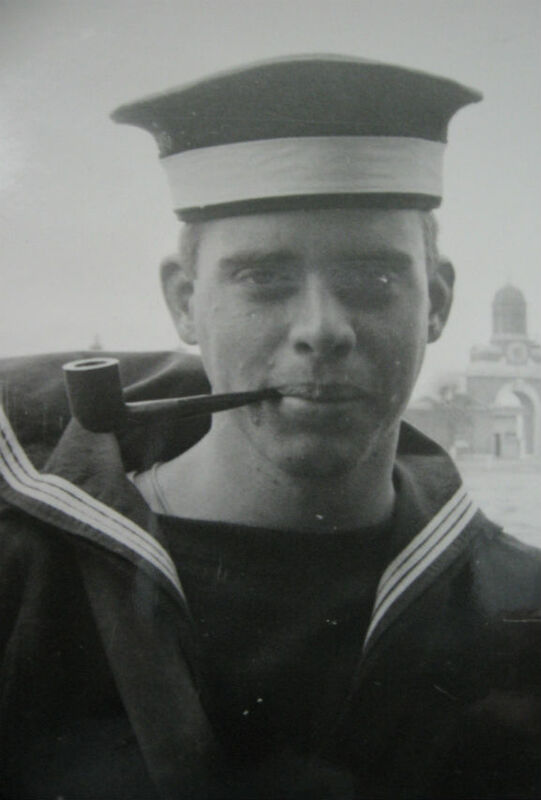 In summer and autumn of 1944 I was wearing the uniform of a humble sailor and was stationed at H.M.S. Daedalus, a Royal Navy Station at Lee-on-Solent in the south of England. From there I was sent in September to Bristol for a few days of writing examinations, doing tests, and being interviewed by a Selection Board, all for the purpose of determining what kind of service I might be suitable for in the Royal Navy. I slung my hammock in an old naval training ship, H.M.S. Flying Fox, which was to be my temporary home. From there I went to my various appointments at the Naval Centre, and in between appointments explored the City of Bristol, which had been heavily bombed by the Germans in 1940. Not far from the ship was a former residential area, mainly working-class housing, which had been bombed almost flat, perhaps because it was so close to the docks. The rubble had not been cleared from the streets, except for a few unofficial footpaths which were being used as shortcuts. On one of them, as I picked my way along, there approached a rattling and squeaking old wagon with one boy pulling it, by means of a rope, and another boy sitting in it. They were aged perhaps six or seven years, but in a war zone it is never easy to guess the ages of children. As they drew near I could see that the pulling boy had no eyes and the sitting boy had no legs. It turned out that they had been orphaned and terribly injured in the bombing. They greeted me and asked politely if I could spare them a few pence. I pulled open my naval moneybelt and gave them all the change I had, those large British coins. I had two chocolate bars (“nutty” in Royal Navy slang) in my gas mask case, so I gave them those. In Britain at that time, civilians rarely set eyes upon chocolate bars. Instead of bolting them down, as I had thought they might do, the boys thanked me solemnly and put the bars in a safe corner of the wagon for later consumption, or perhaps to sell or trade. We chatted, but they were cautious in what they said, because one of their main preoccupations was keeping clear of “The Welfare,” people who would take charge of them and separate them so that one could be taken care of in an institution for blinded children, the other in one for crippled children. The boys were having none of that. They took pride in their mutual self-sufficiency and learned not to trust anybody who asked them questions about themselves. Of the bombing, of their rescue, of their hospitals and foster homes, the boys would say nothing. Bit by bit I learned that there were shelters to which they could go for a meal, a bath, some castoff clothing, and a place to sleep. One such shelter was a church basement (all that survived of the church) which the sitting boy pointed out to me; the rector, they said, was a very kind man who would never betray them to The Welfare. The main thing in their lives, and a source of obvious pride to them both, was their little Business. They went about the footpaths with their wagon, and when the sitting boy saw something in the ruins that might be brass, copper or aluminum, they stopped and examined it, and if it proved to be so, they loaded it into their wagon along with other bits and pieces. The sitting boy did not take up a lot of space in the wagon. In wartime, nonferrous scrap metals were valuable. The boys had a secret place where they hoarded their findings; every few days a middleman with a barrow came along and paid him his estimate of the worth of their scraps, of which he then took possession. In this way they enjoyed a degree of financial independence, or so it seemed to them. It became time to go: The boys had to get back to Work. They politely took their leave and went rattling and squeaking along the footpath. I was incapable of speaking, so I saluted them, then turned away so they could not know that the big, brave boy of eighteen in a sailor suit was crying. Tags: Courage and Remembrance Day.